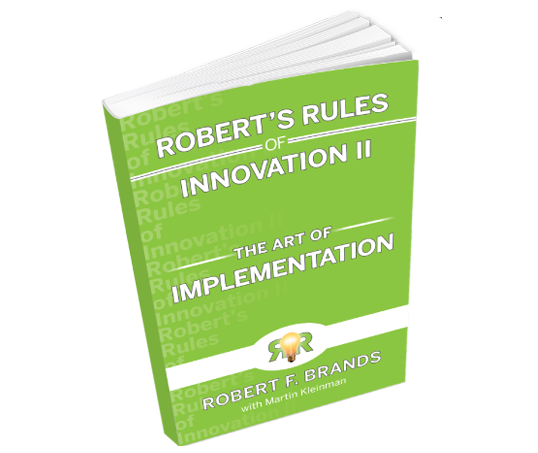 WEST PALM BEACH, December 8th — West Palm Beach’s Liberty Book store will host the international launch of “Robert’s Rules of Innovation II: The Art of Implementation,” the latest book by Innovation thought-leader and global entrepreneur Robert Brands on December 8, 2015. Free and open to the public, the launch event introduces the South Florida business community to Brands who, with co-author Martin Kleinman, leads readers in their quest to implement sustainable innovation, and invites them into a virtual conference room of experts. Liberty Book Store, located at 330 Clematis St., West Palm Beach, will offer signed copies of Brands’ new business book for sale at the event from 5:30 till 7:30 pm. 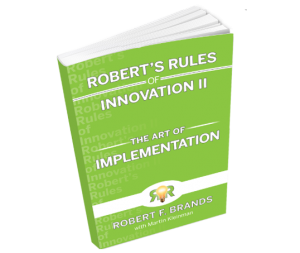 Brands’ hands-on, user-friendly approach builds upon the teachings of his first book, “Robert’s Rules of Innovation: A Ten-Step Program For Corporate Survival,” which was called a “classic” in Forbes Magazine’s “Entrepreneurs” column. Now, in this, his second book, Brands – a long-time area resident – introduces readers to the best and most recent thinking of his international network and details the steps needed to implement a culture of Innovation. Informative, entertaining and full of real-life examples, from a variety of organizational leaders, the “Art of Implementation” delivers the enthusiasm, passion and professionalism needed to succeed in today’s volatile business environment. Concise, understandable, and practical, Brands’ new book is a step-by-step guide to making innovation part of every outfit’s DNA. Brands, Innovation Practitioner and Innovation Coach®, has led innovation-driven companies around the world, and his global network of business leaders comes from different cultures, speaks different languages, and are experts across a variety of organizations. Robert F. Brands is President and Founder of www.InnovationCoach.com. Brands’ hands-on experience in bringing innovation to market spans decades, and includes the creation and improvement of product development processes and company culture for companies around the world. He has delivered on his pledge to bring “at least one new product per year to market” — resulting in double digit profitable growth and shareholder value. Brands has led worldwide teams responsible for marketing and sales, operations and R&D and is a regular contributor to real- and virtual-world media and social networking platforms. Under Brands’ stewardship as President of Airspray Int’l, Inc., the company became renowned as an international innovator in the packaging space, and created the international market for instant foam dispensing. Brands delivered consistent double-digit profitable growth. A native of The Netherlands, Brands resides in Stuart, Florida. Martin Kleinman is a New York-based business writer and communications specialist (www.commstratpr.com). He blogs for The Huffington Post, as well as for www.therealnewyorkers.com. In addition, his first collection of short fiction, “Home Front,” was published two years ago and his second, “A Shoebox Full of Money,” is nearly completed. Martin resides in New York City. – William Silverman, Director, The Launch Pad, The University of Miami, and Co-Founder, Accredify.